Show your support for Ithaca Shakespeare today on #GivingTuesday! Giving Tuesday is a movement to celebrate and provide incentives to give, culminating in a global day of giving on December 1, 2015. The goal is to inspire people to take collaborative action to improve their local communities and help create a better world. ISC has grown into the largest classical theatre program in Central New York, but we face a constant struggle to find enough funding to support that growth. Like most theatre companies, ticket sales cover less than 50% of our expenses. The rest must come from grants and donations, and we need your help to meet this need. And then consider what would be lost if these opportunities no longer existed. You can also give a gift for the rest of December by visiting our "Band of Brothers (And Sisters) 2016" campaign page on GiveGab.com. Please help make #GivingTuesday a great success, while helping to make 2016 a great year for Ithaca Shakespeare! And speaking of 2016, what's coming up first? 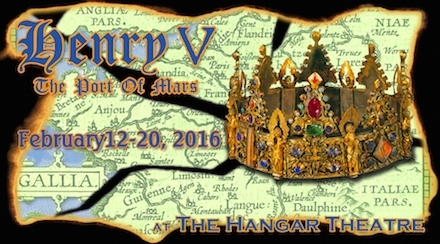 Henry V will be the third production in our series of Shakespeare's history plays. In Richard II, Henry Bolingbroke deposed the lawful king and took the throne for himself as King Henry IV. In Henry IV, Henry fought to contain the rebellions that broke out against his rule, while his son, Prince Hal, caroused in the taverns with Falstaff and struggled to prove himself to his disapproving father. May waste the memory of the former days. Henry V is the story of the newly crowned Prince Hal attempting to follow that advice. In both earlier plays, England is a fractured country, its people and nobility divided over who should be king. In addition, Richard II and Henry IV faced rebellions against English rule in Ireland, Scotland, and Wales. But Henry V is able to unite his countrymen in a common cause by directing their aggression toward an outside enemy: France. 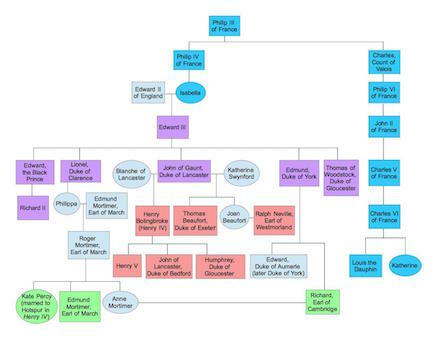 The English argued that this gave Edward and his descendants — including Henry V — a stronger claim to the throne of France than Charles VI, the current king of France, who was descended from a different line of the French royal family. Richard II and Henry IV had not attempted to press this claim, but Henry V took advantage of it to "busy giddy minds" with a war on foreign territory. The morality of Henry's actions is questionable to say the least, but his strategy was undeniably successful: Henry V shows us a (more or less) unified Britain marching to war behind a loved and admired king. Shakespeare symbolizes this unity by giving Henry's army four captains — one English, one Irish, one Scottish, and one Welsh. The Welsh captain, Fluellen, is one of Shakespeare's great characters, fiery and hilarious and completely unforgettable in the way he talks. Don't miss the epic continuation of Shakespeare's Game of Thrones at the Hangar Theatre in February!